This brioche hat is much more easier to knit than it looks at glance! It’s all about the brioche star stitch and there are so many ways to create different cable motifs. The best thing about it: there is no need for a cable needle! For this pattern you have to repeat altogether 4 pattern rows only, which is very effective, isn’t it? Two different versions are given; a slouchy (which you can see above) and a non-slouchy version too! The pattern is transforming from body to crown and the instructions for the crown are as simple as can be, but no less surprising! 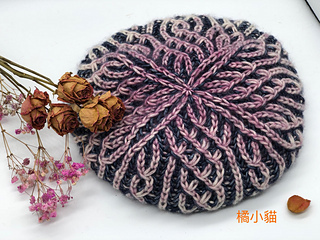 The hat can be knit in multiple sizes only by changing needle size and gauge; Block the finished cap over a steep-sided bowl or other head-shaped form to smooth the crown. Rose version shown was knit with Tieke Merino DK Twist (200m / 115g) in Vintage Rose(MC) and Hedgehogfibres Merino DK in Wish (CC). 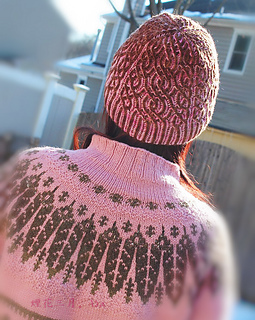 Off-White version shown was knit with La Bien Aimee, Merino DK (230m/100g) in Winter Garden (MC) and Tieke Merino DK Twist (200m / 115g) in Vintage Rose(CC). 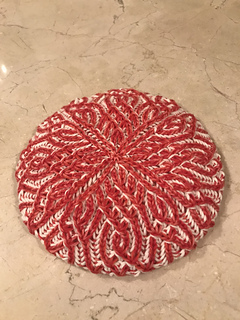 Size 4 US/3,5mm 16”/40cm circular and dpns or long circular for preferred method of working small circumferences in the rnd.